What is it made of? The Koala Mount consists of 2 small but sturdy brackets made of ABS plastic. How is it stuck to the wall? The brackets are designed to be attached to the wall using 3M Command strips (included). 3M Strips are one of the most trusted consumer adhesives on the market today and are rated to hold up to 5 lbs each, which is far more than any smartphone. Setup takes all of 2 minutes. When you decide to remove the mount, the Command strips can be stretched off without leaving any damage or residue. What if I do not trust the adhesives? We recommend performing a simple strength test after setting up the mount to ensure the Command strips have formed a proper bond. Simply hang a bag from the hole in the bracket and place a weight into the bag (such as a 2L water bottle). You can leave it overnight and if it holds, you can rest assured that the Command strips are working properly. Compatibility: The Koala pocket is 11mm deep, so any device thinner than that will work. 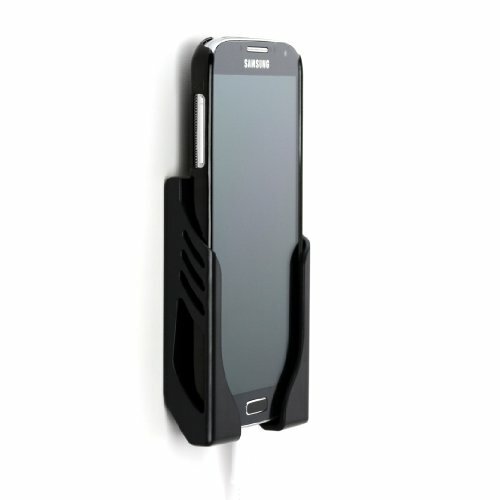 Works with the Samsung Galaxy S6, S6 Edge S5, S4, S3, Note 3, Note 4, and many other Android, Windows, or Apple devices. With small tablets: The side of the brackets come 7 cm up the side of your tablet. With an iPad mini, Nexus 7 (or similar sized tablets) the charging port may be covered if mounted in landscape mode. Package includes: 2 ABS plastic brackets, 2 Large 3M Command Strips, cleaning pad, full setup and removal instructions. Notes: Intended only for use on smooth, non-textured surfaces. Special strips recommended for bathrooms. Note that all buttons may not be accessible on your smartphone while the device is docked. Other: This product can also be used for tablets, and may come in packaging that states it is for tablets. However, understand that despite the packaging, this is also a smartphone mount and you have received the correct product. If you have any questions about this product by Dockem, contact us by completing and submitting the form below. If you are looking for a specif part number, please include it with your message.